It was fitting to run my first ultramarathon in my college hometown of Athens, Ohio on May 14, 2016. 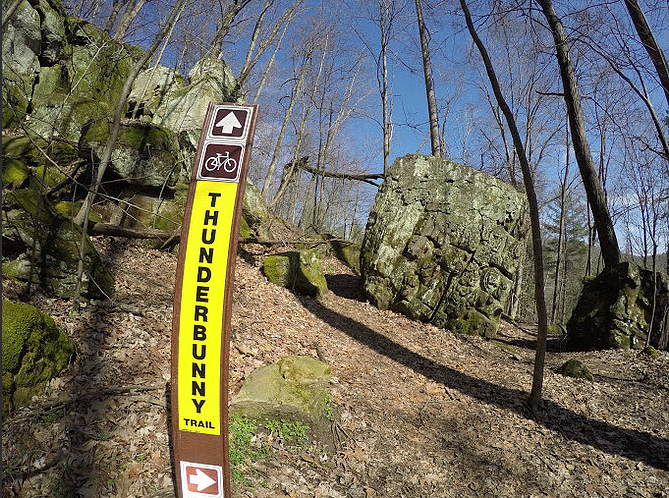 Race Directors Michael Owen and Jonathan Bernard developed the inaugural Thunderbunny 50k at the beautiful Strouds Run State Park. After rain every day the week before the race, I knew this would be a challenging way to gain entrance into the ultramarathoner club. Below are the top ten things I learned during my first ultra. 10) An extra pair of shoes and socks goes a long way, both mentally and physically. Although the fresh socks and shoes quickly became mud soaked, it gave me something to strive towards. 9) Power-hiking steep slopes in mud is not easy. My strategy was to power-hike steep inclines to level out my heart rate, but I found my feet slipping backwards slightly and my effort equivalent to jogging. During the race, I realized I had never practiced power-hiking steep inclines in bad weather. 8) Never line up at the start of any ultra next to Devon and Nathan Yanko! Joking aside (they’re awesome people! ), I knew the more feet that moved through the mud, the worse the conditions would get. With both 25k and 50k runners starting at the same time, I made up my mind to push my pace for the first few miles to get ahead of the crowd. It was a calculated risk that I paid for around the halfway mark. 7) Running down steep hills in mud is not easy. Again, my strategy was flipped on its head as I had spent hundreds of hours practicing alternating power-hiking uphills and making up lost time on the downhills and flats. I found myself forced to walk downhill in several sections, as the steep declines were becoming water channels. 6) Run your own race and don’t judge yourself relative to other runners. A runner passed me at the 19-mile aid station when I was changing my shoes and I never saw that runner again. It was discouraging, and I started questioning myself during those last 12 miles. Afterwards, I found out she was a Leadville 100 finisher. 5) Your GPS is never perfect. The more miles and elevation you run, the greater the GPS error. Mentally prepared to run the last two miles, at the last the aid station I was told there was only one mile to the finish line. Mile 31 was my fastest mile by far. 4) Rain and mud add weight to your shoes. Ultras amplify this added weight over the additional distance. I did not take this into account for my expectations of fatigue and pacing. 3) Practice your race nutrition until it’s second nature. I never used anything other than water from the aid stations. I brought my own S!Caps, Hammer Nutrition Perpetuem and gels. It took a variable out of the equation and made things simpler for me. This is one area that went according to plan. 2) It’s your first ultra, just finish; no one cares about your time. My goal was to run the 50k in sub-6 hours. Halfway through the race I questioned if I would finish. Around mile 20 I completely reset my expectations. After finishing I never had a single person ask me about my finish time. 1) Be thankful for every single step. I enjoyed all 71,200 of them and made sure to use the finisher’s cup to enjoy a beer. It was the best tasting beer I’ve ever had! Great story and check list thanks.